The selection of the works maintains that promise. 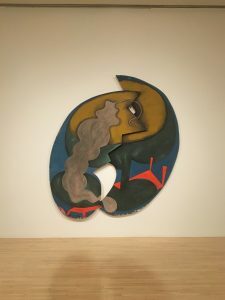 According to Katz, the show exemplifies the role of art at a time when museum “collections are revealing of issues in profound ways,” particularly in the notion that many institutions neglect in displaying art by or depicting marginalized voices outside the traditional white Western narrative. The title also could be referring to the circulation of power in the art world, in terms of sensations, voices and agents of experience. 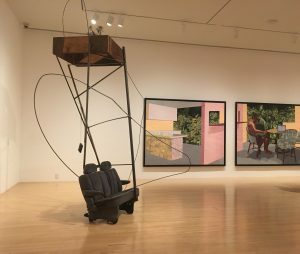 The first gallery features portraiture, with literal works including Deana Lawson‘s rendering (2015) of a leopard-clad woman unabashedly posing in Nikki’s Kitchen, Detroit, Michigan,and Njideka Akunyili Crosby’s 2016 diptych of her and her husband in Garden Thriving. 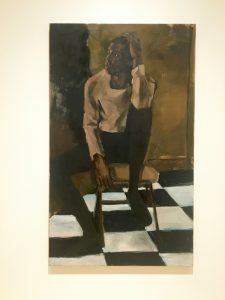 Cultivated portraits are represented by Lynette Yiadom-Boakye’s Medicine at Playtime (2017), an imagined vision of a man sitting hauntingly in an unidentifiable space with a checkered floor, while more representational portraits include works such as Autoconcancion III (2016) by Abraham CruzVillegas, which features a dilapidated car and planters, Rodney McMillian’s Untitled (2006), a kitchen-floor like tapestry on the wall, and Untitled (March 5th), a 1991 piece by Felix Gonzalez-Torres, with intertwined light bulbs hanging ominously and without the promise of staying lit. Placed systematically, these portraits are a reclamation, imagining bodies in the domestic sphere, a traditionally gendered, marginalized atmosphere alluding to servitude. 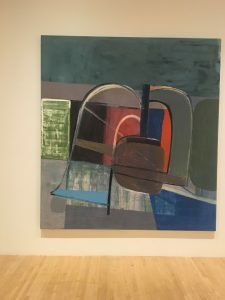 This persists in Garden Thriving, whose inclusion of trees gives a subtle nod to the plants in Autoconcancion III, which features wood chromatically in sync with the tiles of McMillian’s Untitled. Domestically related and keeping with the gradient of the room, Untitled (March 5th) hangs forebodingly on the left wall, its intertwined wires reminiscent of the bodies in Medicine at Playtime and the suggested subject matter of Autoconcancion III—intimacy. 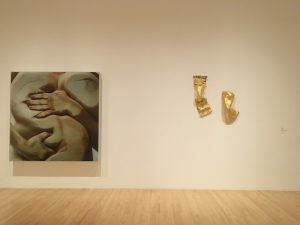 This first room means to suggest that all of these representations are portraiture, in that they have come to and still represent the voices and bodies of those constantly marginalized or excluded in larger narratives based on gender, race, and sexual orientation. Closed Contact #3, by Glen Luchford and Jenny Saville (1995–1996), is a photograph of the artist’s body pressed against glass, explorative of the ever-invasive alterations bodies might go through in elective surgery. 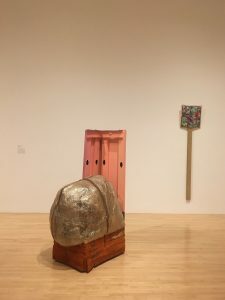 Also included: Untitled by Dianna Molzan (2015) and Jessica Stockholder’s Untitled (1989), a sculptural assemblage of furniture, plants and Saran Wrap, resulting in a bodily, squatting mound that forces us to recognize our own corporeality. 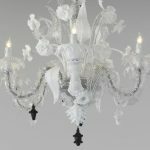 Haegue Yang’s installation, Strange Fruit (2012-2013), dominates the next room and alludes to the 1937 eponymous poem about lynching, written by Abel Meeropol and popularized by singer Billie Holiday two years later. 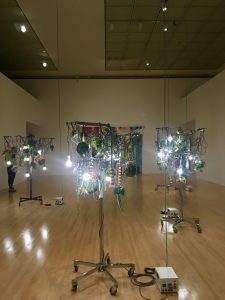 Yang’s unsettling yet whimsical installation is juxtaposed with Tomashi Jackson’s 2016 Avocado Seed Soup (Davis, et. al. v County School Board of Prince Edward County)(Brown, et. al. v Board of Education of Topeka)(Sweatt v Painter), a deliberately colorful dropcloth-like map of the United States and homage to the historical fight for school desegregation. 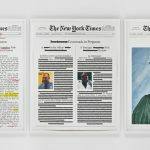 Taken together, these works are meant to question who has the agency to attempt to represent historical traumas, and whether art as a larger historical and theoretical entity is even capable of doing so. 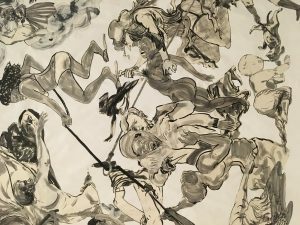 Keeping with the thread of historical commentary, the next room features 2017’s The Pool Party of Sardanapalus (after Delacroix, Kienholz) by Kara Walker and 1959-1960’s Drawings for Dante’s Inferno by Robert Rauschenberg. 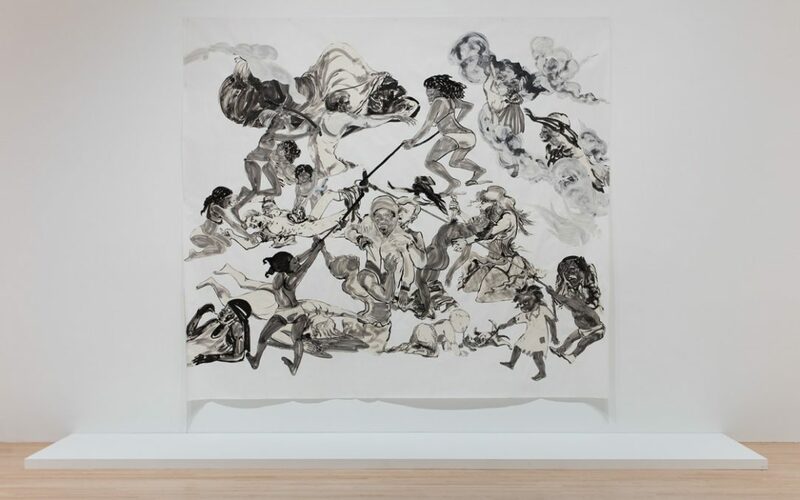 These works further the notion that there are different ways to reflect upon, relate to and represent subjects, with Pool Party a layered, large-scale drawing with cutouts that juxtapose historical and classical narratives to re-imagine the terms of racial violence. Reversed, inverted and perverted, many of these scenes reflect how the horror of slavery continues to haunt our country. Rauschenberg’s work reflects the artist’s anxiety around issues of sexual orientation, Cold War tensions and the human experience as a whole. 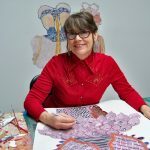 Both pieces exist as vast conglomerates of scenes rendered with writhing energy and unrelenting horror, their points of intersection lying within the larger narrative of human experience. 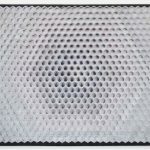 In its brilliant colors, textures and connecting narratives, the works converse with one another, with the exhibition also suggesting that the issues exist enduringly, commanding to be noticed in a similar weave, spanning peripheries of nearly endless variety. 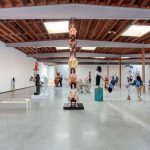 Focusing on notions of the self and those of the female form to larger historically racial battles, this exhibit is an experiment in clash and connection, a concise and confident display of the potential of museums as testament to their power to be catalysts for social change.